Share a standard USB printer with multiple users simultaneously over a wireless network. The PM1115UW Wireless-N Print Server lets you share a standard USB printer with multiple users simultaneously over a WiFi network, or a wired LAN connection. 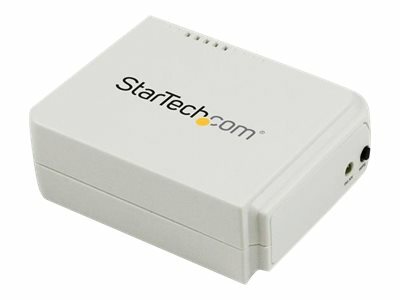 This compact wireless print server supports 802.11b/g/n wireless standards for functionality with almost any wireless network, plus, serving as a primary or backup interface the print server also offers an RJ45 port for 10/100 Mbps wired connections. Providing wireless network printing access enables you to place your printer in any location with network access and avoids the added cost of purchasing individual printers for each workstation or area. This wireless USB print server can have you up and running in minutes, using either a web-based interface or a Windows based installation wizard, and also features a WiFi Protected Setup (WPS) button for quick and easy connection to your wireless network. Compatibility with USB 2.0 standards and a wide variety of USB printers and operating systems makes this network print server perfect for installation into mixed environments, with Simple Network Management Protocol (SNMP) support for remote monitoring.